Renowned Malayalam poet and lyricist ONV Kurup has been chosen for the 'Guru Vagbhadananda' Award for enriching literature. "It was happy to select ONV for this prestigious award", Vagbhadananda Trust said in a press release on 16th November 2011. The award carries a cash prize of Rs 25,000, a citation and a statuette. 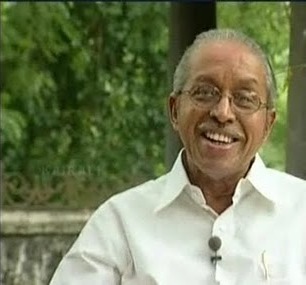 The award will be presented to Kurup at a function in Kozhikode in December 2011. ONV is considered as one of the finest living lyrical poets in India. He had won many awards earlier including the highest literary Jnanpith Award for the year 2007. He received the awards Padma Shri in 1998 and Padma Vibhushan in 2011. In 2007 he was bestowed an honorary Doctorate by Kerala University. 0 Response to "ONV Kurup bags Vagbhadananda Award"